The temperature dial allows you to choose an optimal temperature from 0 to 660 °F according to your recipe. The same dial also has pre-set settings for Thin, Medium, and Thick pizzas. The viewing window might become misted from the inside. This is a premium pizza maker that gets very close to a brick oven in delicious results it delivers. 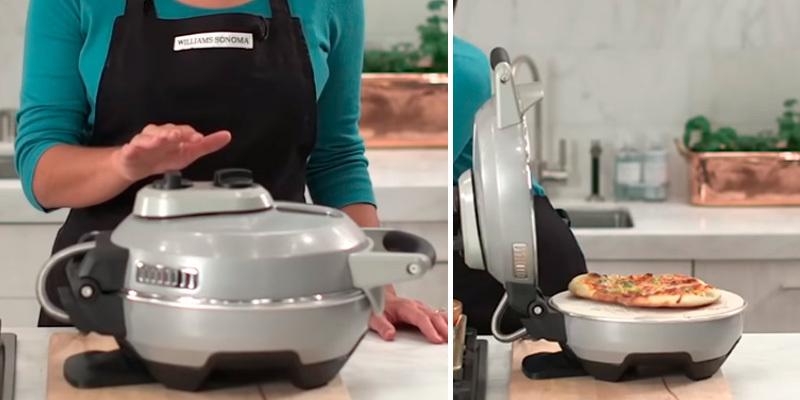 It can cook even thick crust pizzas, so it's an absolute must-have appliance on your countertop if your family adore crispy Chicago-style pizzas. Separately controlled heating elements of the Presto 03430 pizza maker ensure the most precise adjustment of the baking temperature of both pizza crust and topping. An audio beep signal indicates the end of the cooking time. Compared to some other models, this pizza maker works a bit louder. You can both watch your yummy dishes baking and smell mouth-watering flavors! 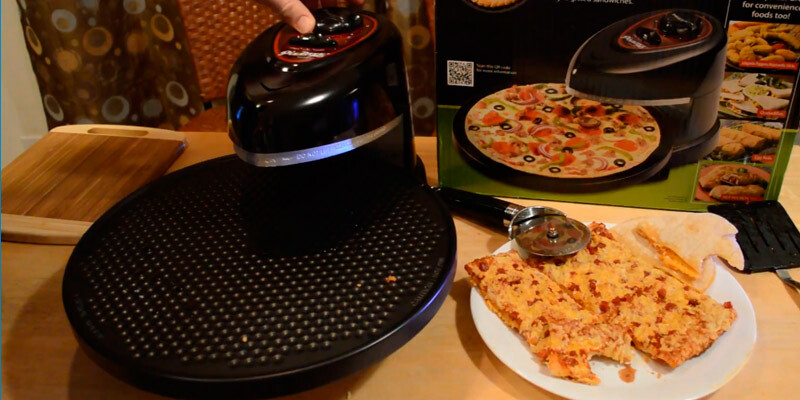 With the open construction of this Pizzazz pizza maker, you can actually see when your meal is ready! 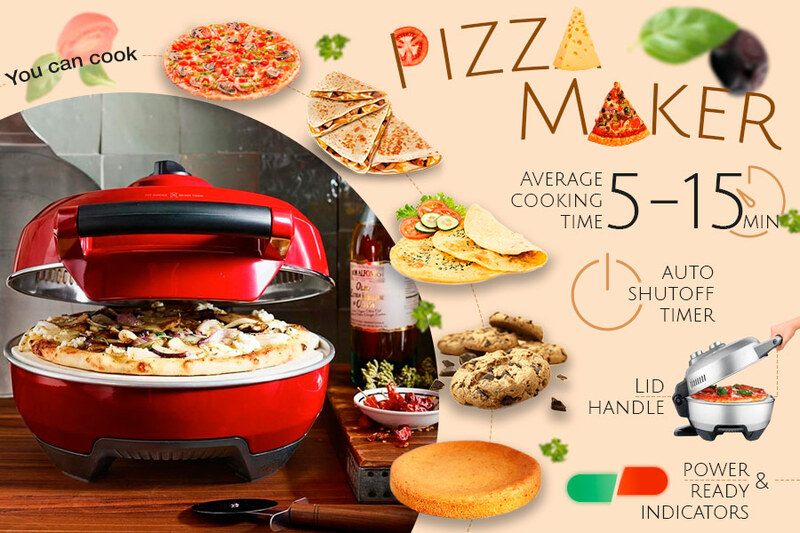 The productive capacity of the Betty Crocker pizza maker allows you to cook a variety of dishes in minutes! Its non-stick bottom and top are easy to clean after use. The handle may heat up so it is better to use oven mitts. 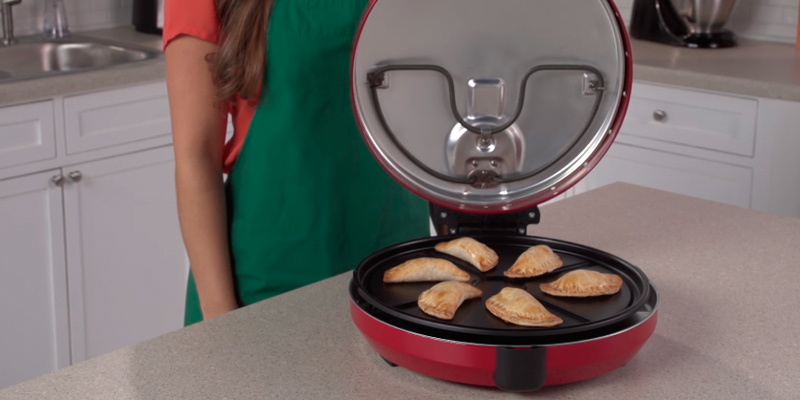 If you and your family appreciate all kinds of pastry, choose this Betty Crocker pizza maker! It will bake yummy pizza and many other delicious golden brown treats. Maintainance of this Hamilton Beach pizza maker is very simple thanks to its removable dishwasher safe tray. You can check if your pizza is ready without opening the lid thanks to the viewing window. It takes some time to install the tray on the rotating driveshaft. 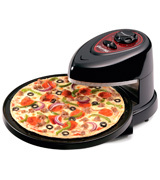 With the Hamilton Beach pizza maker, even beginners will cook yummy pizza! 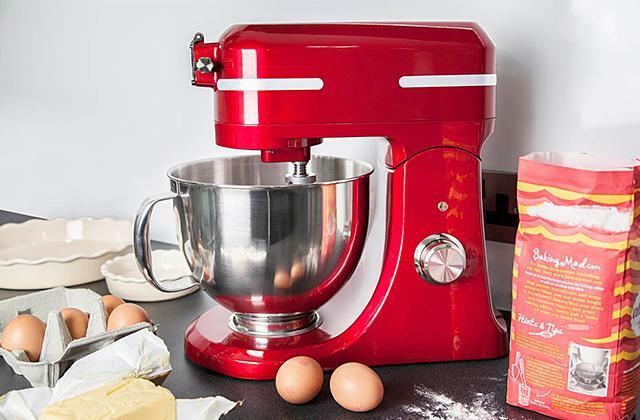 This modification was designed to let you control the whole baking process. 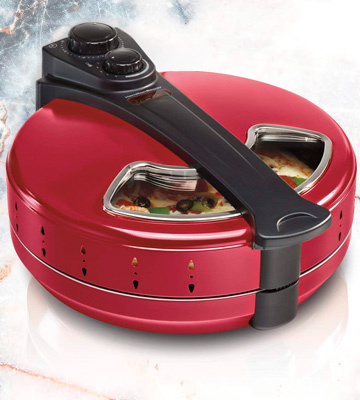 The NewWave pizza maker has the unique heating elements design. It will cook pizza in record-breaking five minutes! Owing to the included metal paddles, it is easy to pop pizza in the appliance and remove it when it is ready! A ceramic coating is a bit harder to clean. Owing to the deep-dish pan of this pizza maker you can cook both pizza and pies. Your family and guests will be delighted at how easy and fast cooking pizza can be. The Breville company offers a premium pizza maker that gets very close to a brick oven in performance and fantastically delicious results it delivers. With dual heating elements, a built-in ceramic baking stone and 1200 Watts of power, the cooker can capture that high heat which is so important for baking crispy pizzas. What is interesting about this pizza maker is that it claims to reach 660°F maximum, but, in practice, reaches more than that. Many users acknowledge that its performance is much better than advertised and allows cooking restaurant-quality pizzas within just 5-10 minutes, which is a fantastic result. The heat up time here is also fast - in 5 minutes, after you turn the cooker on, you'll be able to create your culinary masterpieces. A nice addition in the cooker is a viewing window. Thanks to it, you can track the baking process without opening the lid. Equipped with special settings for thin, medium, and thick crusts, the Breville pizza maker can suffice the needs of all pizza lovers. The device automatically adjusts the cooking time and temperature which allows it to deliver evenly baked pizzas, regardless how thick the dough is and what kind of toppings you put. The Breville pizza maker can cook freshly-made pizzas as well as frozen ones, with up to 12 inch diameter, enough to feed 2 or 3 people. 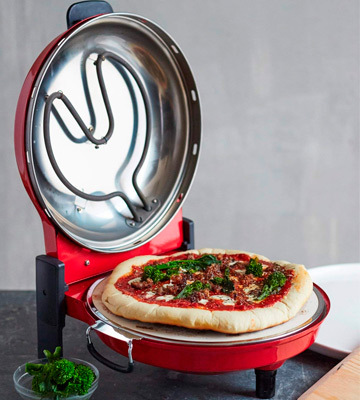 However, the best thing about this pizza maker is that it's versatile: you can cook in it not only pizzas but also croissants, pies, mini frittatas, quesadillas, nachos, omelets, and even roast meat. 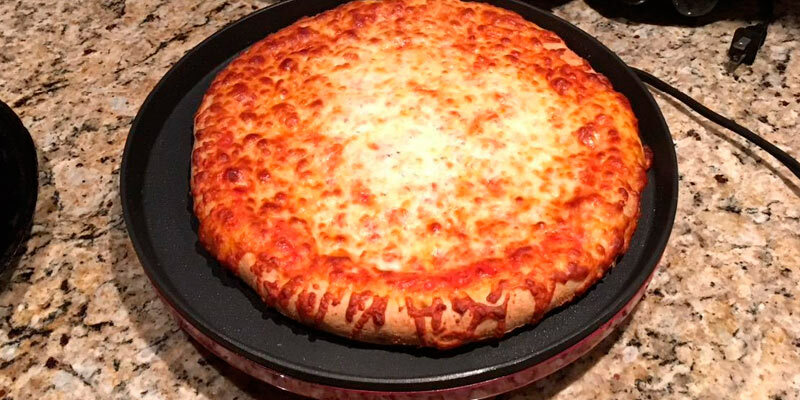 Using the Breville Crispy Crust pizza maker is very easy. It has only 2 knobs on the lid so there's nothing to be confused about. One knob is used for powering the device, the other one is for selecting the mode: High, Low, or Keep Warm. You can also adjust the crust thickness choosing from Thin, Medium, or Thick, depending on a pizza base and the toppings you use. Not all pizza makers guarantee ideal baking results but the Breville oven is different. 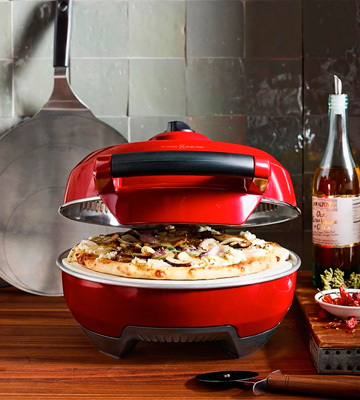 It absolutely nails it, offering you a surefire way of cooking flawless crispy Chicago-style pizzas in the privacy of your own kitchen. This pizza maker machine is notable by its open design. 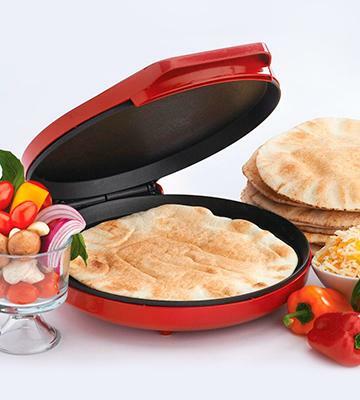 You will have your pizza evenly cooked with its rotating baking pan! Besides, it is nice to look at your favorite dishes when crisping and the topping when melting. It both smells and looks delicious! 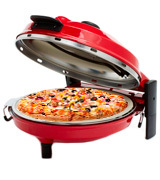 The appliance has separately controlled heating elements and a rotating tray so you will have your pizza evenly baked. 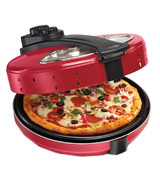 In addition, it has a removable non-stick baking pan, making it easy to release the pizza. 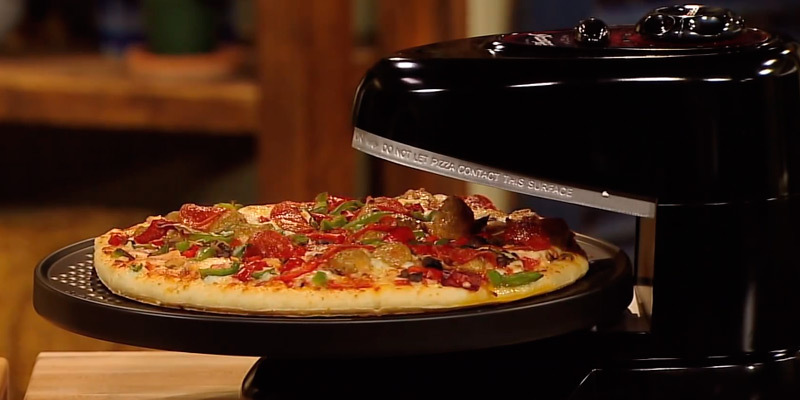 The Pizzazz pizza maker turns cooking into a pleasure! 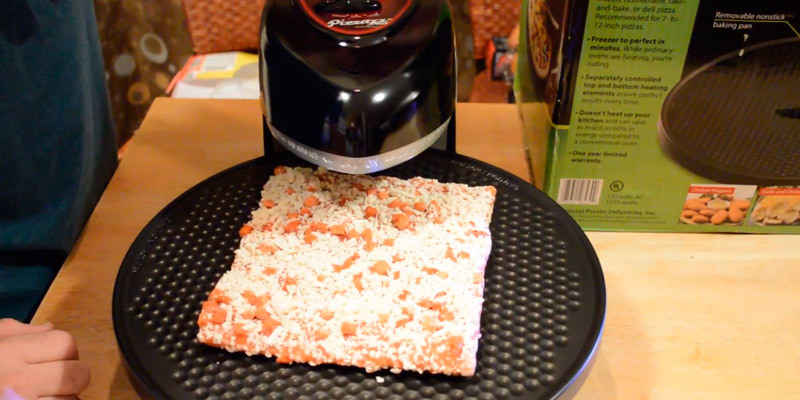 You will be surprised by a vast variety of dishes this Pizzazz pizza maker can cook. You can bake fresh and frozen pizza, chicken nuggets and wings, fish fillets, egg rolls, and even such delicacies as cinnamon rolls and cookies. You can have your sandwich quickly warmed up or even crisped to a golden brown. Its cooking surface diameter of 12", is enough for 2 or 3 people. 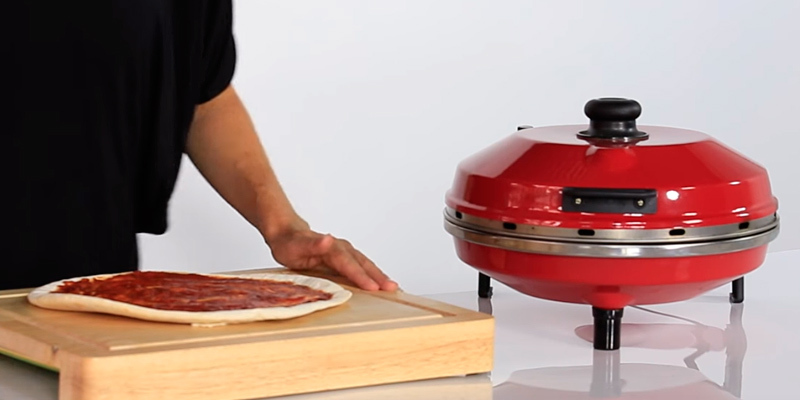 The capacity of 1235 W allows baking a pizza in 10-12 minutes (depending on its base width and topping ingredients). 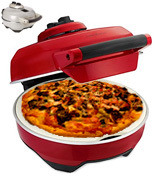 A very useful feature of this Pizzazz pizza maker is the adjustable baking (3 modes). You can use either both separately controlled heating elements at a time or just the top/bottom one. Choose the desired combination depending on the dish you are going to cook! For example, you can leave only bottom heating element on if the base isn’t entirely cooked and needs a few minutes more. 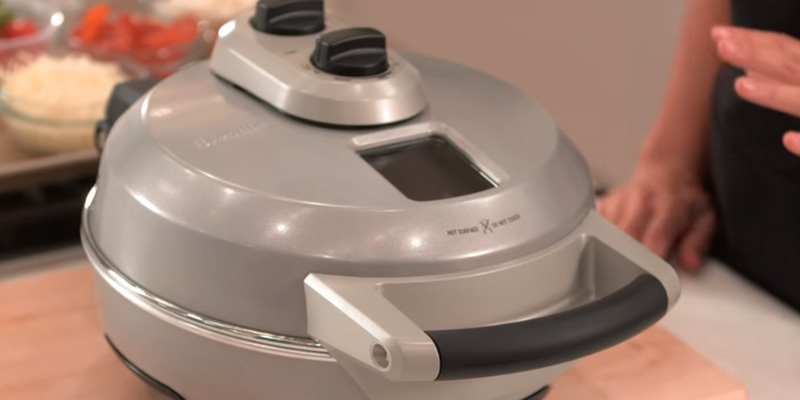 The device has an ergonomic timer to set up the cooking time (20 min maximum). 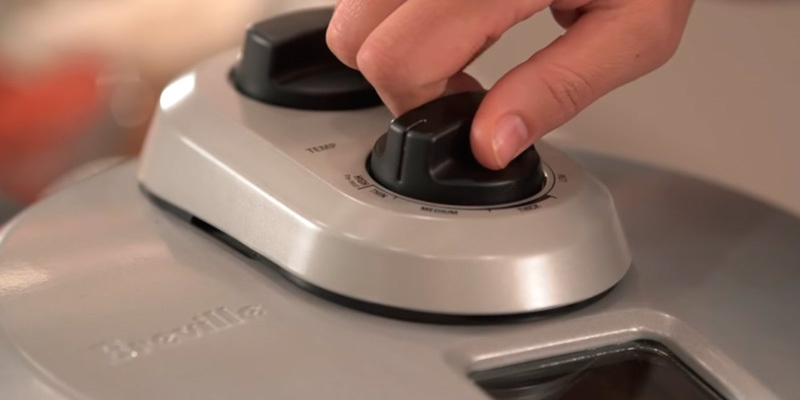 The appliance will signal when your delicious pizza is ready and shut off automatically. 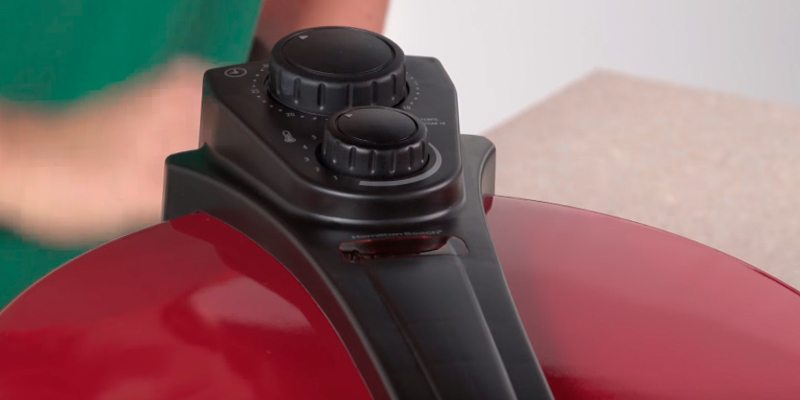 In addition, this pizza maker comes with an easy-to-clean removable tray. Please, pay your attention that hand wash is recommended to extend its lifespan. Betty Crocker BC-2958CR: 6.3 lbs. 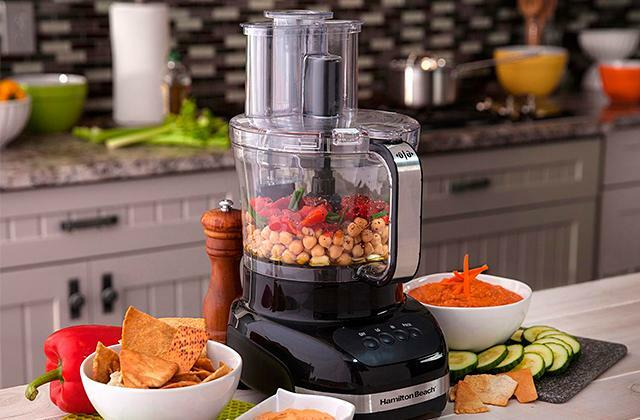 Hamilton Beach 31700: 6.4 lbs. It uses the exact same amount of power as our toaster over and takes the exact same amount of time to cook a pizza, but this cooker bakes a pizza much better and evenly. And it is easy to moderate temperature with the top/bottom/both switch on the top to avoid having parts overcooked or undercooked. 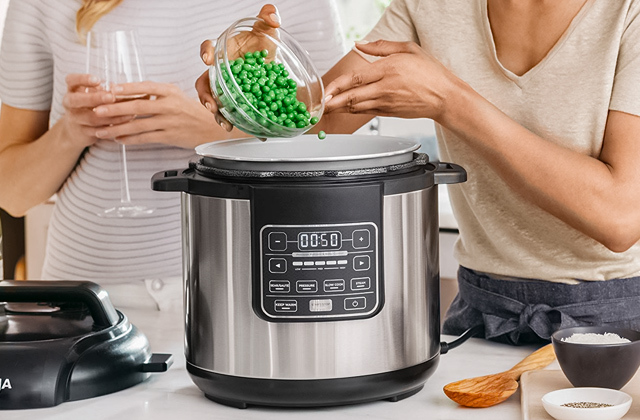 It does offer a lot of control with the dual heating elements. It has variable cooking functions, where I can cook the bottom / top / or both sides of the pizza if necessary. 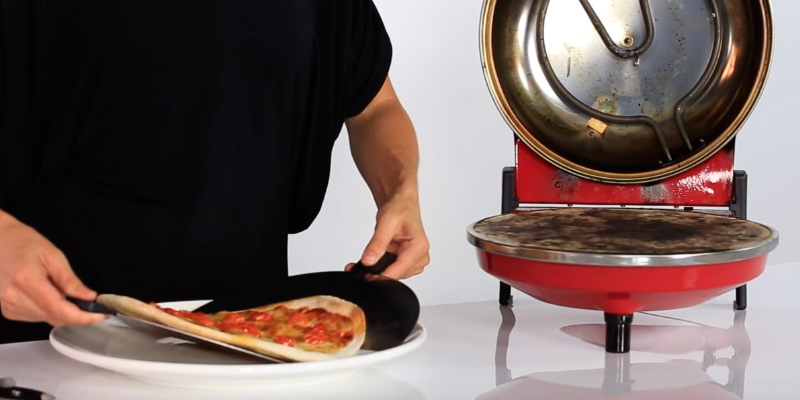 Thoughtfully designed, this pizza maker will help you cook a toothsome pizza with minimal effort! It is a closed type modification. Just put your pizza into the appliance and its top and bottom heating elements will generate the heat for baking a delicious dish with a crispy golden crust. It is easy to remove the pizza from an ergonomic non-stick coated baking plate. Please note that it is not recommended to cut the pizza on the plate in order to prolong its service life and prevent a damage risk. If you are going to bake a homemade pizza for your family members, choose this wonderful modification! It is good for baking frozen pizza as well. Just make sure that its diameter is not beyond 12" (the maximum possible size to load into this pizza maker). 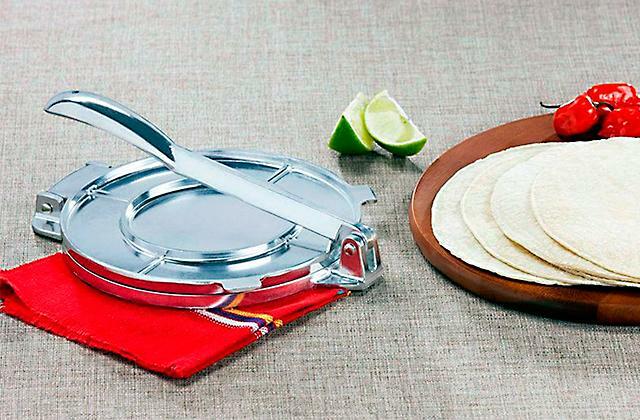 You will be able to cook stunning omelets, quesadillas, mini frittatas, nachos, cookies, croissants much faster than using a conventional oven! 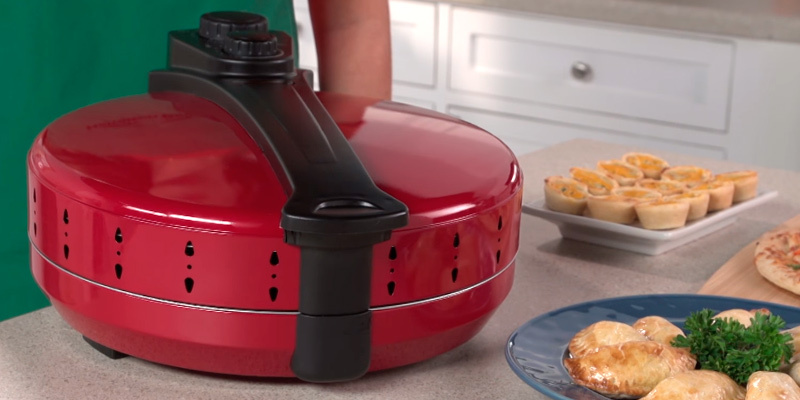 With its power of 1440 W, this Betty Crocker pizza maker bakes pizza in 10 min. However, the cooking time may vary depending on the ingredients and dough thickness. The appliance has a red indicator light that turns on when you plug the pizza maker in. After the device is on, it takes a few minutes to preheat. Wait until the green ready-to-bake light indicates that the pizza maker is ready to cook. A built-in thermostat identifies the ideal cooking temperature. There is an ergonomic opening handle on the lid. Please, use oven mitts when you grasp it to prevent burning your fingers. 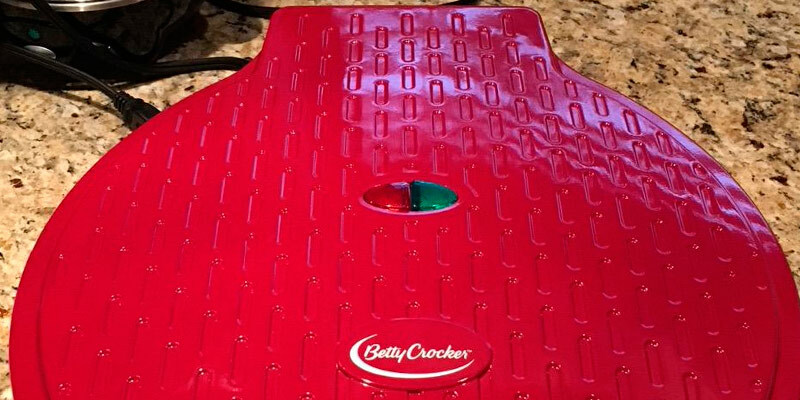 You will cook the most delicious dishes with the Betty Crocker pizza maker! We recommend you to try and cook the recipes from the book that comes with a purchase. You will amaze your family and friends with awesome original pastry! It has upper and lower heat elements. so it cooks from both sides. Also great for cooking/heating up other foods. easy to clean too. 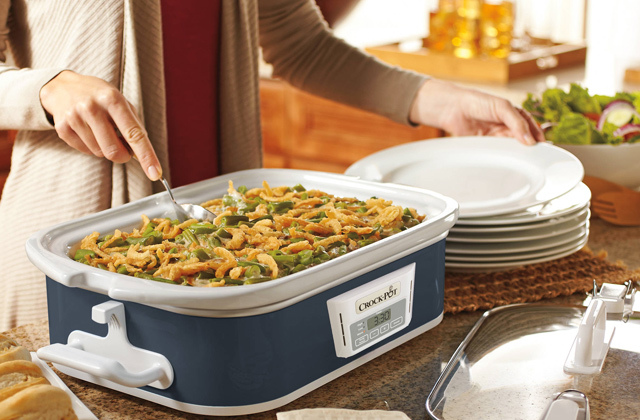 Easy to clean thanks to the non-stick coating, heats up fast. Has no power switch so need to plug and unplug to use/not use. This wonderful Hamilton Beach modification allows fast and quality baking of your favorite pizza. It has a close design and two heating elements, the best solution for even baking! You won’t need to pay for pizza to be delivered. 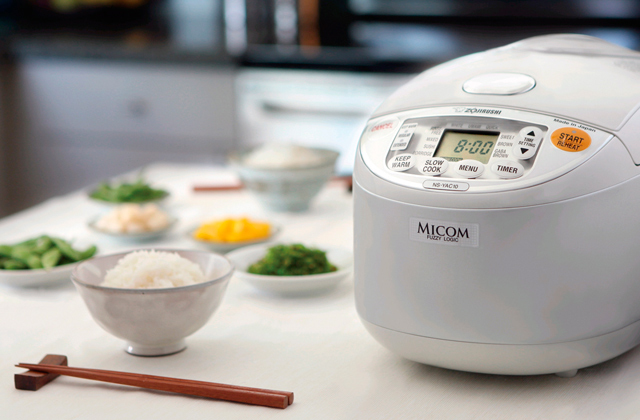 With this marvelous appliance, you can enjoy the desired eats whenever you like it. 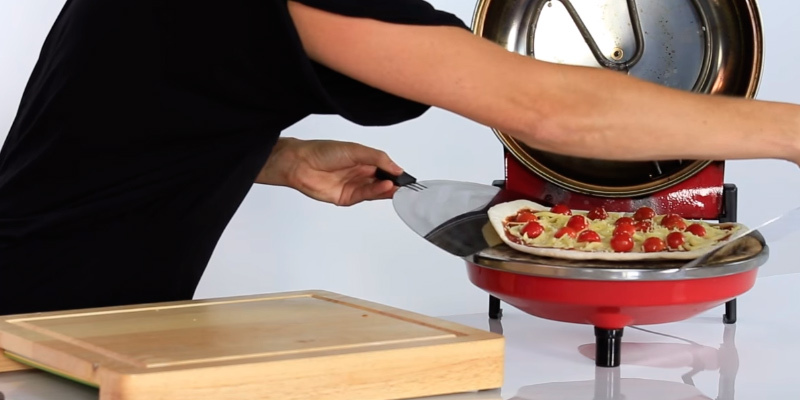 А baking pan is rotating during the cooking so you will get a well-baked pizza! 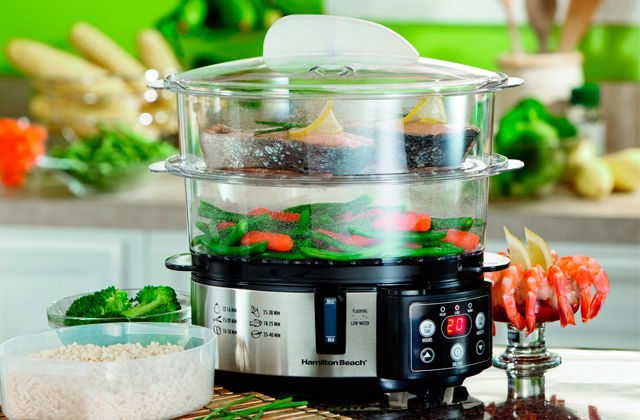 It has a durable non-stick coating that ensures a long use of the appliance. If you’d like to treat your family with an exclusive meal from pastry, it is hard to find an easier-to-use appliance! 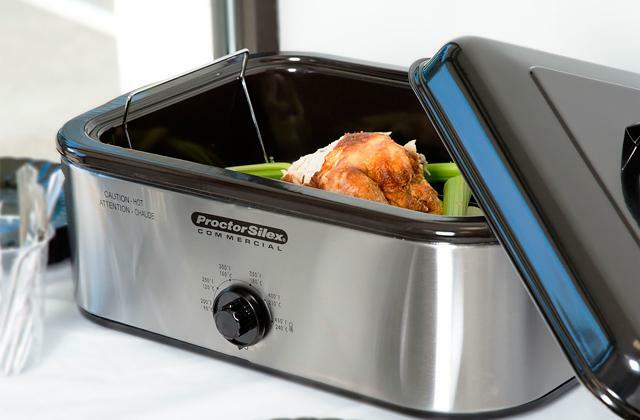 Unlike most conventional ovens, it requires no preheating. The maximum power of 1200 W allows baking pizza in just 12-14 minutes depending on whether it has been frozen or not. You can cook a pizza up to 12" in diameter, large enough for 2 or 3 people. It bakes smaller dishes even faster. This pizza maker is an awesome kitchen appliance! For the perfect baking of both pizza crust and topping, the manufacturer has included a built-in temperature control (5 modes). For example, you need to bake a frozen or thick pizza with many toppings. They require higher temperatures compared to freshly cooked or thin variations. There is also an auto shutoff timer to set the precise cooking time. There are two indicators to inform you on the appliance operation. An ergonomic viewing window makes it easy to check if your dish is ready even without lifting the lid. This pizza maker is easy to maintain (its removable pan is dishwasher safe). Betty Crocker BC-2958CR: 13.8 in. Hamilton Beach 31700: 13.38 in. You can adjust the temperature to how you like your pizza. Set heat level and timer and walk away. I used it for rising crust and takes about 35 minutes. 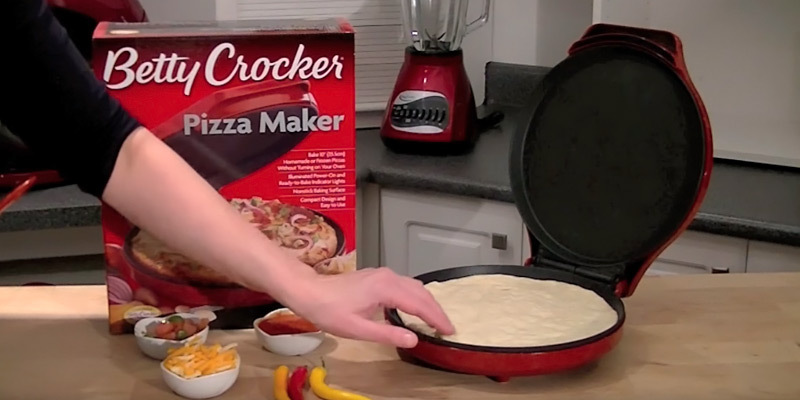 Nice timmer feature, cooks frozen pizza very well even with added toppings, but do not pile on too much (high) or you will contact upper cooking grill. The Petite Pizzeria has a closed design that ensures its safe use and keeps the heat inside. 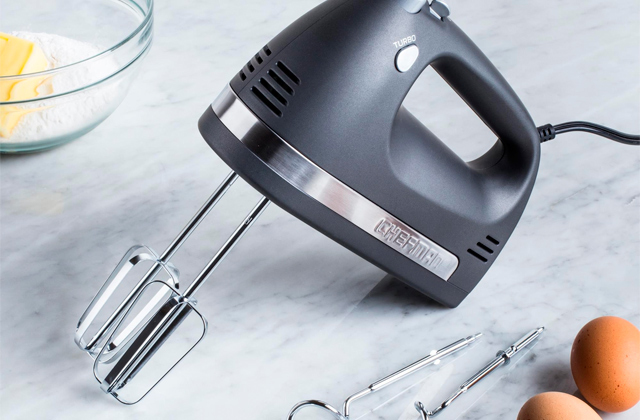 It has W-shaped top and bottom heating elements for the most efficient and even baking, and a ceramic stone surface for non-stick results. Many professional pizzailos recommend cooking on this exact type of surface, as it allows achieving a delicious crispy crust. Another advantage of this surface is that it's very durable and will last longer than many other analogs. Cook freshly made, frozen and Chicago-style pizza in this wonderful 12" diameter pizza maker! It has ample space to bake the pastry for 2 or 3 people. Apart from that, you can cook other treats such as pies, frittatas or even roast meat. The power of this pizza maker is 1200 Watts, and it takes about five minutes to cook a pizza. You will be able to add your favorite toppings while the appliance is preheating (it takes just five min). 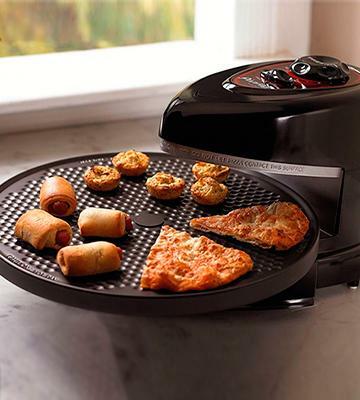 The NewWave pizza maker is a must-have appliance in your kitchen if you and your family love crispy homemade pizza! This functional pizza maker has an ergonomic heat indicator (the red light turns on when the appliance is ready to bake). There are three modes of the heat control dial. You can choose one depending on the pizza base and the topping. The non-stick deep-dish pan that comes with the purchase allows cooking a high Chicago-style pizza. This way, it won’t stick to the upper heating element and the topping won’t get burnt. The included metal paddles will help you put the pizza in the device and remove it when it's ready. Also, the device has an ergonomic lid handle on the housing that adds to the convenience of use. As an extra bonus, the manufacturer supplies this model with a recipe book so you can cook a great variety of pizzas and other bakery goods. Using a wireless digital thermometer probe to monitor the temperature it can actually maintain a very consistent lower temperature, good for baking cookies! It's ridiculously easy to use I bought some dough at the supermarket, rolled it out, added a little olive oil, sauce, and cheese. Then put it in this thing for about 7 minutes, and the end result was great! I'm convinced with a few more tries my pizzas will be indistinguishable from a restaurant. What Is a Pizza Maker? Pizza is a worldwide famous traditional dish originated in Italy that has become extremely popular worldwide due to the variety of toppings it can go with. Everyone can choose what to put on their pizza crust. Maybe, that’s the secret of its popularity! It is not so easy to prepare a pizza in a conventional oven (it takes much time and effort to preheat and cook).Pizza maker is a kitchen appliance specially designed for cooking pizza and other delicious pastry in a matter of minutes without time-consuming preparation. When cooked in a pizza maker, your pizzas will come out evenly baked with a melted topping just like if they were cooked in your favorite restaurant. We recommend you to use pizza cutters to slice your pastry evenly without damaging the palatable topping. Pizza peels are designed to lift and slide it onto the plate. 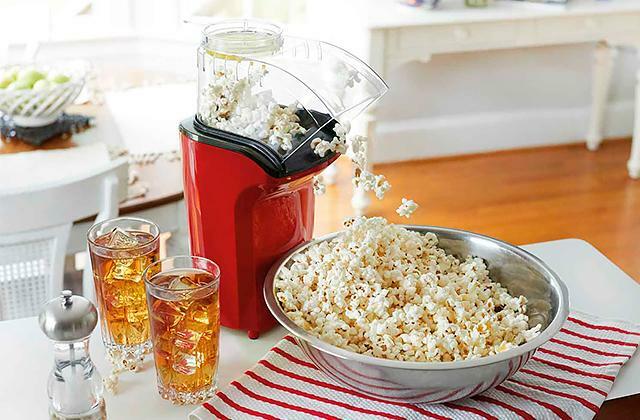 And if you love refreshing drinks, make sure to check out these iced tea makers. Pizza makers can be open and closed. An open pizza maker offers some obvious advantages: it's easier to place pizza in it, and it allows for viewing what's happening to the crust. On the downside: open pizza makers emit quite a lot of heat, which can make your kitchen unbearably hot if you decide to cook batches of pizzas. When it comes to pizza makers of closed type, they do not produce that much heat and are safer to use in general since there's no risk of touching hot surfaces. Consider the placement of heating elements. They should be located on both sides of the appliance so that the heat is distributed evenly throughout its surface. Speaking of the surface, it is important that it's non-sticky and enables easy removal of cooked pizzas. 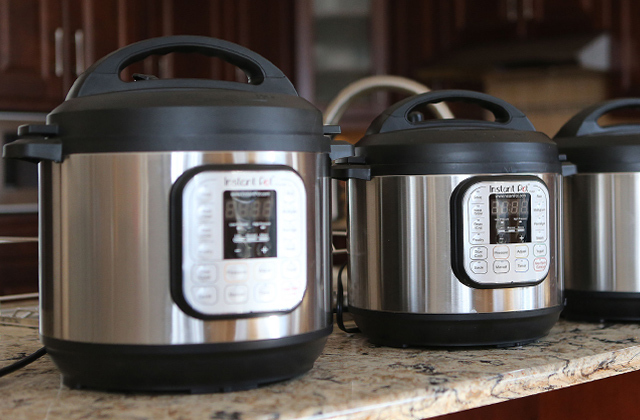 Power is essential when it comes to any cooking appliance: the higher the better. Speaking of pizza makers, 1200 – 1500 is considered the ideal wattage. With this kind of power, a pizza maker will let you cook not only pizzas but many other savory dishes such as tarts, pies, omelets, cookies, croissants, and more. In fact, you can even roast meat in it and fry chicken nuggets. The cooking time may vary, but usually it's around 7-15 minutes and depends on the power. Extra features are what make pizza makers different and also convenient (rarely not convenient) to use. Temperature control will allow you to adjust baking depending on dough you use and the topping width, which is quite important considering that different pizzas require different temperatures. Thanks to the temperature control function, it's easy to check when a pizza is ready. A rotating pan, which usually comes as part of the package, is used for even heat distribution. Indicators help check out if a pizza maker is heating or it's ready to use. 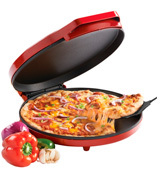 Some pizza makers include additional accessories such as a non-stick pan and paddles which add to its convenience of use. 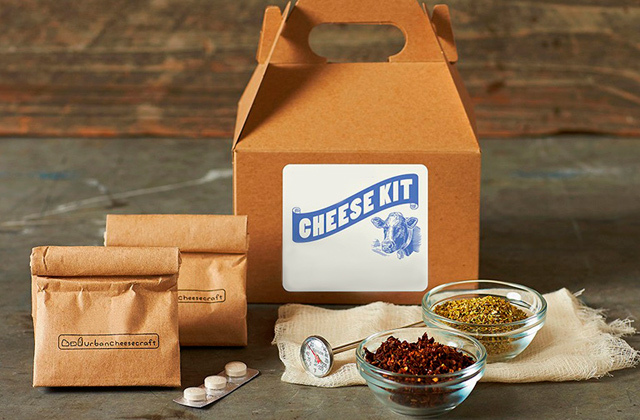 Often you will find a recipe book included in the package too.